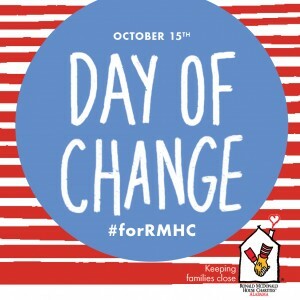 On October 15th, RMHC is celebrating its annual Day of Change! This is the day when the entire RMHC global organization commemorates the opening of the very first Ronald McDonald House which opened in Philadelphia in 1974. To celebrate, we rally around Donation Boxes to ensure that we can continue to keep families together when their child needs to heal. What does that mean for you? You know those pennies, dimes, nickels and quarters in couch cushions and under the seats in the car? Put them to good use. Celebrate the #DayofChange #forRMHC families at participating McDonald’s. Your spare change can make a big difference. RMHCA will be at several local restaurants (listed below) with red and white stripes socks on hand (that can be yours in exchange for a $10 donation) and more information on how to get involved with RMHCA. Your change can make a change for families who must travel to Birmingham for their child’s medical treatment. Together, we can make a big difference in Birmingham for #RMHCA. Because of your support, we can provide stability and resources to more than 1,000 families every year, and support more than 64,000 visits to our Ronald McDonald Family Room. If you are unable to get to a McDonald’s on Day of Change, you can give online specifically for the celebration. 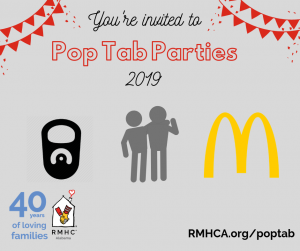 (Of course you can always donate online for RMHCA as well!) You can also help share the event by joining us on social media. We have set up a Facebook event page and will be keeping you updated on other ways to show your support for the organization! If you or your organization is interested in collecting change #forRMHC — we have custom Donation Boxes we can give to you — please contact Laurie at laurie.smith@rmhca.org or (205) 638-7269 to coordinate.